Rated 5 out of 5 by Dahlia2012 from My New Favorite Game This is such a refreshing break from my stash of HOGs and HOPAs. No dreary demons or decaying mansions in this one. Just bright and pretty colors and fun to be had everywhere. Love this kind of game. Too bad all M3's aren't as good but this one stands out. Endless hours of play, four different games in one. This falls into what I call major stress relief and "mindless fun". 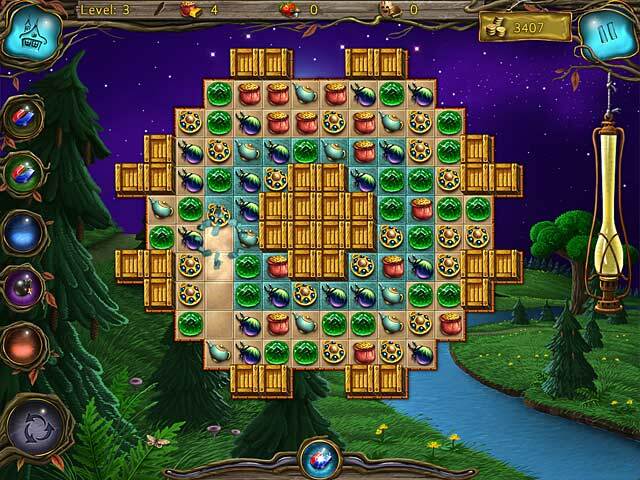 Definitely a bit of strategy with each puzzle but nothing that overworks the old brain. Just fun, relaxing and with a pleasant soundtrack and heartstoppingly beautiful graphics. Bring on more of this type of game, BigFish, please! Rated 5 out of 5 by hislamb from lost in entertainment this is a surburb and yet familiar work and i will continue being a fan of rumbic studios, they are masterful at the art of descent casual p c games !!!!! Rated 5 out of 5 by Billybadass4018 from A really great match 3 First match 3 games don't really a storyline and this one did not have one. Bejeweled didn't have a storyline and it's a very popular game. My favorite thing about this game it that you have to collect gold to build a small village. The artwork is beautiful and I loved the mystical woodsy style of the village. One building is a mushroom house. There three different styles of match three games chain, swap, and group. All three are very fun and it's refreshing to switch to whichever I prefer at the time. As you progress in each type of match 3 the levels become harder to beat. 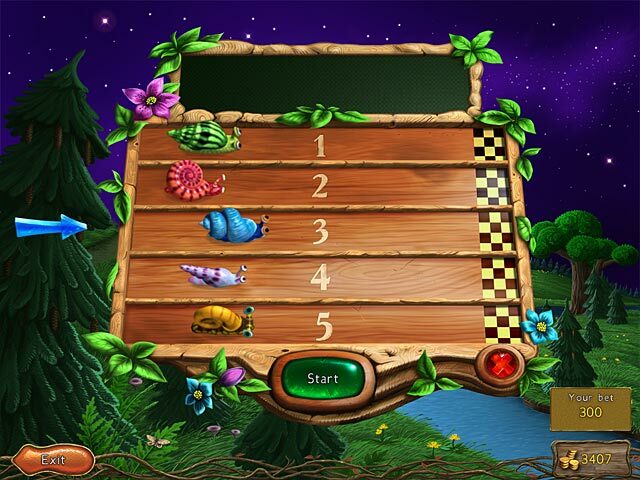 There are also trophies to collect and an extra "Snail Blitz" where you bet on a snail to win a snail race. I think it's a very cute and fun add-on. The awesome thing is I have not quite beat the game yet but I could definitely see myself playing the game long after I beat it. Rated 5 out of 5 by murnahan1 from Loved this Game! I was fun. You take your points and build magical village. Rated 5 out of 5 by yogijudy44 from Great fun game for all family members This is my very first review but liked this game so much wanted to recommend it. 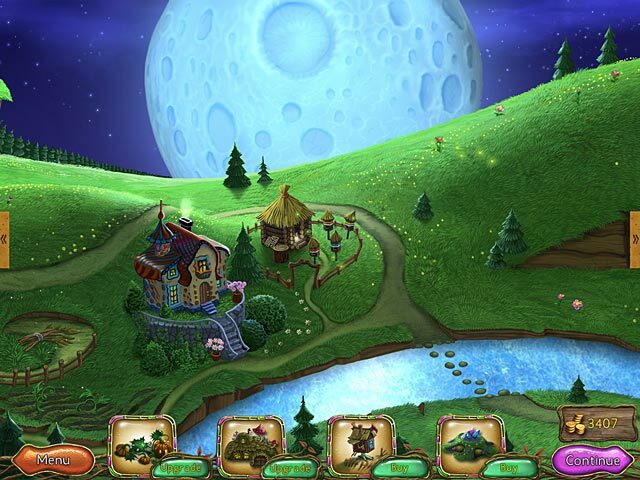 If you enjoy playing for relaxation and like cute fanciful graphics this game is for you. You build a wonderland with the money you win. I also enjoy the maddening snail races. There are 3 different match-3 modes you can choose from and the music wasn't all that bad either. Rated 5 out of 5 by hodgepodgespv from good distracting fun i got quite a kick out of playing this game. the art work is lovely and i like that you can play the connect 3 in 3 different ways. Rated 5 out of 5 by denniann2 from great graphics and relaxing game i really liked this game! it wasn't very hard and would be good for children. you earn bonuses by matching icons and they help you win each level. there are over 100 levels but it doesn't take too long to finish. i didn't time it but i didn't play constantly, either. i had to go do other things. you build a small city with your earnings and sometimes it takes awhile, but again, it is a pretty easy game to match. i got to the end and it said i completed all the buildings but it kept on letting me match. going to look into that. i must have missed something. 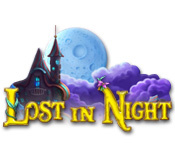 Rated 5 out of 5 by MrsBen from Lost in Night is a Mesmerizing game! I love this game!! I love the game play, the graphics and I really enjoy the music! This game is just FUN! Rated 5 out of 5 by MaryMR from A Great Relaxer I enjoyed playing this more than I expected: after a long day in the office it was visually pleasing and very relaxing. I couldn't ask for more. I found myself looking forward to completing the lovely little village and would enjoy another similar game. Rated 5 out of 5 by Books_Garden from Loved it! Loved the bright colors and great graphics - a nice change of pace from the dark and gloomy HO games. It's a simple enough match 3 type game easy enough for young children, but has definite appeal to a wide range of age groups. The artistry displayed in the fairy tale town kept me playing, wanting to see what was next. I normally turn background music completely off, but the soft variations on a theme in this game was a very welcome change. A great stress buster break game. Rated 5 out of 5 by gwenofala from Caution this game can be addicting ! This is my first match three game, and I have enjoyed it ! Downloaded the trial because I didn't see anything new that I liked in the HOS and Adventure games that I usually love ! I liked the different game play modes, I love the group play the best, you have all the trophys to win and to build an enchanted little town, even after the town is built and the trophys are won the game isn't officially over until you complete all game modes ! Rated 5 out of 5 by ShotGunRyder67 from Too Cute to Spook This is just an adorable, cute game that visually satisfies. Would be a great game fo kids as it's not difficult to play and the graphics are very engaging. Rated 5 out of 5 by Lyndy20 from Charming M3 This is an addictive game, with pretty graphics. In fact, you can think of it as three M3 games in one, because each mode has its own set of levels and interesting layouts. The modes are swap, group and chain and you can change modes whenever you feel like it. Each new mode you enter will take you back to level 1 and new layouts, although the building element stays the same, e.g. if you have already built a few buildings in one mode you still attain the same building level. The buildings are pretty and fairy-like, and can be upgraded. Once fully upgraded, a new building becomes available. Great value for money and strong replayability. Rated 5 out of 5 by PascaleArtemisia from I enjoyed this game! If you like match 3 games you will like this one. Rated 5 out of 5 by luv2playBFG from Love the three styles of Play! I have been having so much fun with this game. I love that I can use swap, group or line to play and each of those settings have their own levels and layouts. This game takes hours to finish and for a match three that is important to me. I find it challenging as I get further into it. I adore the cute little buildings that evolve from successfully finishing different levels and acquiring the needed points. Well done to the designers - this is a game worthy of my time, providing me with hours of enjoyment. Thank you! Rated 5 out of 5 by SouthernGal820 from Want to relax...buy this game!!! After only a few minutes of gameplay I'm buying this game. The graphics are GORGEOUS!!! Even the M3 pieces are pretty!! After so many dark games this is such a nice change of pace. You can play timed or not, music is good. I highly recommend this game!! Rated 5 out of 5 by deborahami from Fabulously fun game! I love the different kinds of M3 styles. It challenges but doesn't get boring. It's not the same thing over and over again. The artwork is beautiful. The tiles are easy to see and distinguish from on another. I wish there were more games like this. Total win! Rated 5 out of 5 by cathousemama02 from An adorable relaxing game! Did'nt take the full hour to decide that the game flowed very smoothly, the graphic design artist had had a really good day, and it had appeal people of all ages and skill levels! Didnt encounter any annoying or glitchy aspects of the game, and really enjoyed myself in the brief time spent with it......so, purchased it to enjoy it at my pace! Rated 5 out of 5 by IsisRising from Loved it! I really like this game and the graphics. It has wonderful sounds and its not too difficult. Once it is purchased there are other patterns, not just chain. I would highly recommend it to anyone. Rated 5 out of 5 by Hillbilly_Gal from Awesome Addictive Game I'm in my late 50's, married, the mother of 17 children, my 16th grandchild was just born 2 days ago with my 17th grandchild due in 3 months. I play computer games to relax after spending another day of cleaning our large home, talking to our grown children & our grandchildren on the phone, running errands, doing laundry, and much more. This is what I call an ideal Match 3 game. There is a variety of ways you can match the items which I like. This is a very easy game, very relaxing, and very enjoyable. With the money that you earn on each level, you buy a pumpkin patch, a cottage, a beehive & much more then upgrade each item. At the bottom of your screen you will see how many upgrades are available for each upgrade. There really is no time management involved that I like. The graphics are rather cute and colorful. I think my grandchildren would really enjoy these graphics. This is a game for all ages. My 14 month old granddaughter, for example, doesn't have the coordination to operate the mouse but with an older child or adult operating the mouse, my 14 month old granddaughter points to where each object should be moved to. For me, this is a must own game. I love it. For an old lady like me to enjoy a game, that's saying something. Rated 5 out of 5 by cowclaudia from Charming little game with pretty graphics and easy play - great for those days you want entertained but don't want to spend "brain power" on a more complicated game. There aren't any instructions but its easy to figure out so no problem for kids. Rated 5 out of 5 by kdubs from One beautiful Match-3! I enjoyed the trial hour very much. No surprise since [b]Lost in Reefs[/b] by the same developers is one of my favorite M-3's. Beautiful graphics, 3 modes of play (swap without having to click the 2nd tile :thumbup: , chain, and group). There are several powerups which you earn as you make matches. The Shuffle button fills fairly quickly also as you make matches. As you earn points, you can "build" your village. It's simplistic, with no choices other than to keep upgrading til complete. That said, it's a nice little break from the M-3. To my mind, it's beautiful in a whimsical fairytale way. There is a choice of Timed or Relaxed which you can easily change. There are several trophies too. I didn't try the mini-game more than once since I was in the trial, so I wonder if the Snail Race is purely a matter of chance and intended just to be an extra little relaxation. Although there is a trophy for it too, so of course I'll do it often enough to win that one. :D I played the trial in Timed mode so I learned how the game warns you that you are nearly out of time. It's a nice chime tone :thumbup: , rather than the heart-beat thump which made me so nervous in Cradle of Rome and Cradle of Egypt. Still, even though it's a gentle warning, I'll likely play more of it Untimed. I had a PCC expiring ini 4 days, so snapped up this beautiful relaxing game today. Rated 5 out of 5 by goaliemom3490 from Too cute of a game I think this is a fun and cute game to play if you are looking for something to play just for a little while as you build yourself a nice little town. I enjoyed the music, it is a catchy little tune. Rated 5 out of 5 by meanmirva from Beautiful, Relaxing Game This game exudes a level of polish that is missing from most M3's that I play. I've only played in relaxed mode, and it took me a couple levels before I realized that I didn't have to clear the level as fast as possible. In fact, the longer you play a level, the more money you get! I can't get over how beautiful this game is. The graphics and animations are top notch. Rated 5 out of 5 by debzzzzy from Fun Match 3 game I love this game. Easy to see board. Bright Colours which is always good. Nice story, although would have been nice to choose different scenes, eventually you have same whatever you choose. For this developer a top for me and I like it.